Pale Ones t'skrang - FASA Games, Inc. I'm pretty sure I remember reading a whole adventure dealing with those and (I think) it was involving a Great Dragon guarding/working with them. I'm NOT talking about the Westhrall Passage/The Way Out game module but something else. I think there was also (either with that or elsewhere completely) an rule that (slightly) changed the t'skrang racial bonuses if you decided to roll a Pale One instead of the 'main' t'skrang. Anyone here can point me in the right direction? OK, so found another game module/shard called Pale River that refer (ever so slightly) to Earthroot but I'm pretty sure I had seem an adventure involving the Great Dragon and/or the White Tree in more details. The Dragon books gives more details about his links with the Pale Ones and confirm that those t'skrang can see in the dark but, again, I'm sure I have seen actual game rules about that where they were trading another racial ability (I think) to have Low-light vision or Heat Vision (can't remember which). The write-up for the t'skrang in Denizens of Earthdawn Vol 1 (reprinted in ED3's Namegivers of Barsaive) talks about the Pale Ones, and the ED3 book gives them Heat Sight as an additional ability. The bit about the White Tree, I think, originally comes from the Dragons sourcebook. 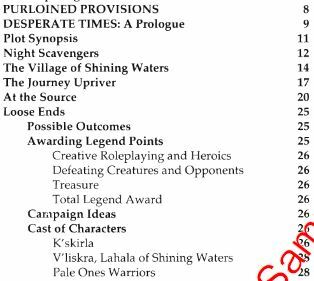 The ED3 Serpent River book might have incorporated some of that into any sections it has about the Pale Ones (and might have had an adventure seed or framework in there as well). The only other adventure I can find dealing with the Pale Ones is the final chapter of Blades, but it doesn't relate to Earthroot or the White Tree at all. On an completely unrelated topic: I was reading the description of the battle of Skypoint in the 4ED Gamemaster book and noticed that there is no mention of the appearance of the Airship Earthdawn during the fight. Was that 'retconned' out from 'Barsaive at War' or was it just omitted? The events of 2nd edition did not happen in the current timeline. Similar events happened, as both were based on a set of notes from 1st edition Fasa days, but 2nd is no longer cannon. One of the ideas was that the Earthdawn might serve as either a gateway to lands beyond the Theran Empire, or a third "Legends" book. As far as ED4 goes, the Earthdawn did not return as part of the assault on Sky Point. I think it adds an unnecessary complication to the whole affair -- the battle is epic enough without having a long-lost airship show up out of nowhere. Which is not to say that you can't find dozens of people whose best friends cousin swear they saw it! Not all legends need to be actually true in order for them to be widely told. I thought of that one, too, but it also doesn't have anything in it about the White Tree or Earthroot. Sure, but that kind of brings up a point I didn't... I'm not sure what to do with the Earthdawn, and I think it's better to leave its fate up in the air if I can't think of something suitably awesome.